This week sees the expansion of the Art In Wax website, I have added a new demonstration page to show a selection of the videos we have made about painting in encaustic wax and showing techniques and my style of painting. I have also expanded the sites shopping facility adding new sections for ACEO paintings and miniature pictures ideal for Dolls’ Houses. 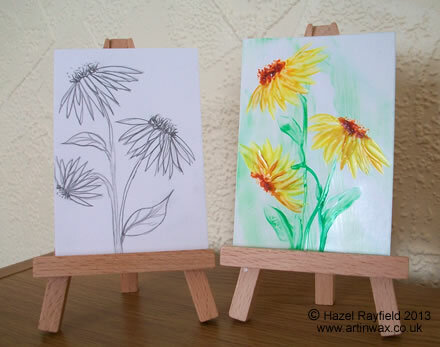 Buy Direct from the Artist : ACEO collectible paintings can be purchased direct from Hazel Rayfield the Artist. Currently the ACEO’s featured for sale in the new ACEO shop are both hot wax encaustic paintings plus a couple of mixed media, which are either watercolour or pencil drawings and wax combined. All ACEO are just 2.5 x 3.5 inches in size and come supplied in a cellophane sleeve. New Paintings : One of the newest paintings is the daisy picture shown in this post. Inspired : I did a pencil drawing ACEO inspired by looking in the garden. From this sketch I then painted in hot wax. I like to sketch out my paintings sometimes, it is good to be able to plan the layout of the picture a little I find. Plus doing a little pencil or watercolor doodle is a good way to remind me while out and about or when I get ideas in my imagination of what I want to paint when I next get back into my studio with my waxes. The new Miniature paintings shop page is now online and I will adding some miniature paintings very soon, following the success of a recent Dolls’ House painting commission I have decided to add a dedicated shop page for these tiny paintings. All paintings are original, not prints. Miniature Art – Dolls’ House paintings can be purchased direct from Hazel Rayfield. Again the pictures featured will be a combination of hot wax encaustic paintings and mixed media artworks, which are either watercolour or pencil drawings and wax combined. The shop will also includes sets of pictures. Whereby a miniature paintings and an A5 size painting of the same subject will be sold as a set. 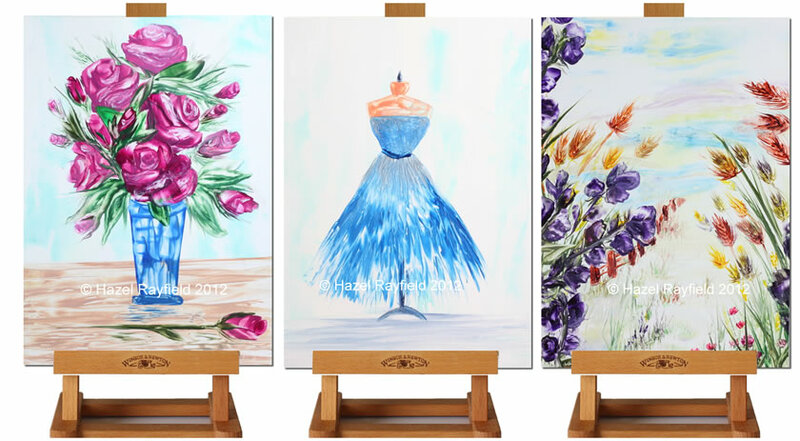 So it could be fun to have an original painting in your home and one similar in your Dolls’ House. All paintings are a one off therefore should a painting be ordered by two people while we are away from the computer the first order, time stamped, will receive the painting ordered, in the event this happens, we will refund the money to the other party and if possible offer an alternative painting. Delivery : We do not dispatch pieces without cleared funds. All purchases are sent by 1st Class post. Delivery is free of charge in the UK. We are happy to ship world wide, for international orders please contact us for details, before ordering. Beauty may well be in the eye of the beholder, and what we all like or dislike about art is the same – individual and personal choice. How we display our art is also a personal choice, as an Artist married to a keen photographer our home has lots of artwork displayed. We have framed pieces of art, we have framed photographs on the wall and free standing we also have several display stands in varying sizes on which I display some of my encaustic pieces. When purchasing art either online or in a shop, knowing how and where a piece will be placed is often an important part of the decision as to what we buy. This post shows how some of my encaustic art paintings could be placed on a display easel, the image below are all A4 size paintings arranged on a Winsor and Newton Brent Table Easel which I recently bought online at Fred Aldous, not expensive and looks great on our book case. 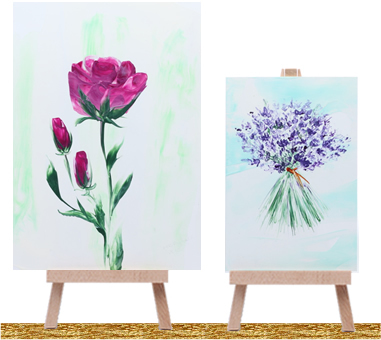 I also have several smaller display easels ideal for the A6 and A5 size paintings and even a few mini ones for the ACEO’s. When displaying my encaustic paintings on a display easel or stand I use only paintings that have been hard backed, due to the natural of the material; wax, they need to be rigid to avoid damage to the artwork. All of my paintings for sale online come either mounted ready to frame or backed with a 2mm backing board, which can either then be mounted and framed or displayed on a stand. The paintings look great on the display easels another advantage of displaying art in this way is it is movable, no need to drill holes in the walls etc. and to maintain the sheen can occasionally have a light dust with a clean cloth. The smaller pieces (6 x 4) either on a small or mini easel can make great home décor accessories adding interest as an alternative to ornaments. When people see pieces of my artwork in our home or when they have received one as a gift perhaps, the comments and feedback I have had is how amazing it is that such art is created using wax, the colours, texture and wonderful sheen the paintings have needs to be seen to be appreciated in my opinion!